This test driver has the sunroof open and the rear wing up during a highway cruise. 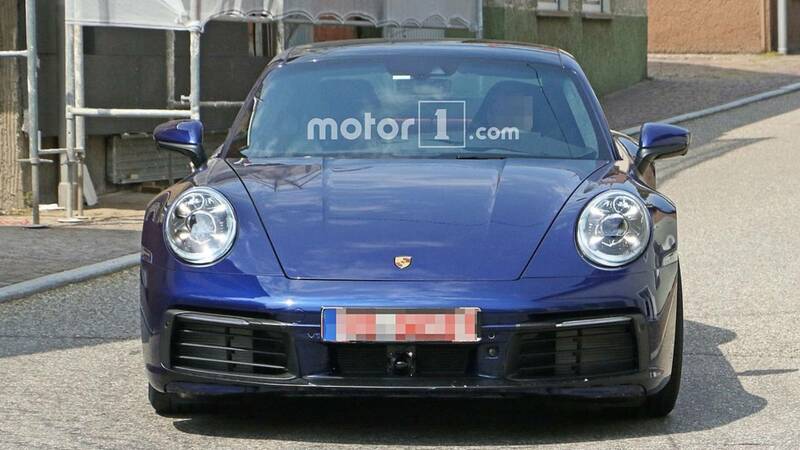 Development of the next-gen Porsche 911 seems to be nearing completion, and a new video catches a test mule cruising down the Autobahn. The vehicle wears Porsche's usual black paint for development, but concealment panels appear limited to the corners of the rear fenders. The third brake light also appears to be a placeholder part. This test driver isn't pushing hard and is just navigating through traffic. The sunroof is open, and the active spoiler is up. The clip provides a chance to see how the taillights look when illuminated. Red LEDs extend across the entire rear. When the wing extends, the light on it takes over the duty of the third brake light. Rather than the temporary third brake light on this test mule, earlier spy shots on a nearly undisguised example (above) indicate that Porsche intends to incorporate the illumination into the vent on the rear deck. While not visible in this clip, we know that the new 911's cabin gets major upgrades. An analog tachometer remains in the center of the instrument panel, but digital displays now flank it. The center stack is rather short, which should help outward visibility. The infotainment display is on top, and the center console features an array of chunky switches. The next-gen 911's powertrain remains a mystery. It might retain the existing 3.0-liter biturbo flat six but with updates to boost the output. Customers looking for more power can wait for the more powerful Turbo, and a more efficient hybrid model is several years away. Speculation puts the new 911's reveal at the Paris Motor Show in October and for sales begin in early 2019. A multitude of variants, including the convertible, GT3, and many others, will roll out over time.